* Annual Meeting is in the afternoon at the Alna Meeting House. Sorry, I can never remember the time when I write these! * Track work: I don't know what is left to do after last weekend. * Machine shop: I don't know what's left to do there either (other than wiring). The weekday crew is setting up a train for us for first thing Saturday morning. 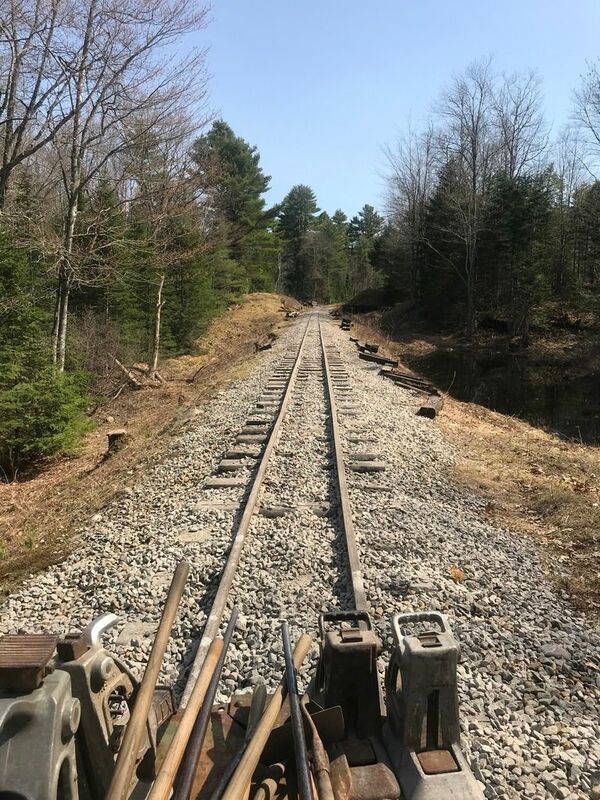 We will be going to Davis cut to ditch and pick up some ties (all with the Kubota) and will need some help straightening the ties as they get set on the car. I would like to depart about 7:30. We need to return by 10:15 so the 10:30 train can depart. generally tidy up around Sheepscot to neaten up for visitors. I'll try to hit some of this, but if someone gets a head start, it would be much appreciated. 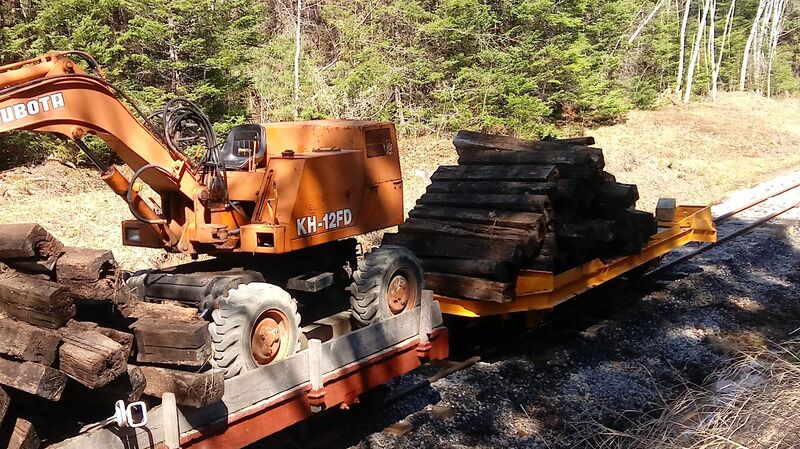 We still have one machine to get out of Bay 4 (the Cincinnati Mill), which I'd like to place on a tip-car chassis for storage until we get the K&T up and running. My Dad and I plan on doing the move, might need another hand, and will need 9 pulled out if that's possible. 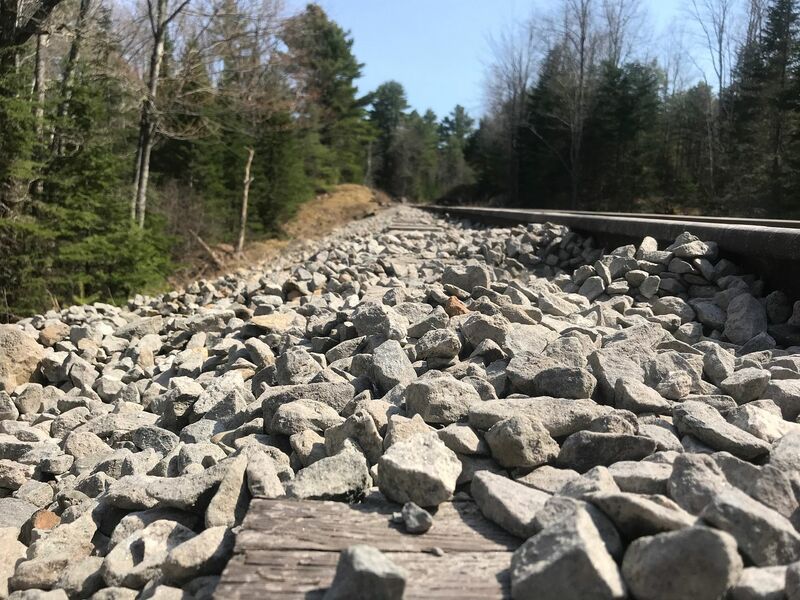 Other track work to be done (not necessarily this weekend) will include surfacing and tamping the areas that need it between Brook Corssing and Sutters. Speed restrictions will be put up as needed, and posted tomorrow or Friday for the work area. I will post a generic track projects list of things to be done with or without a leader in by the sign in book. Things such as tightening loose bolts, and replacing a couple of joint bars. Theres a lot to do this year, and I hope to get a day or two this year to raise some rough spots such as MP6, and MP 7 to ToM. 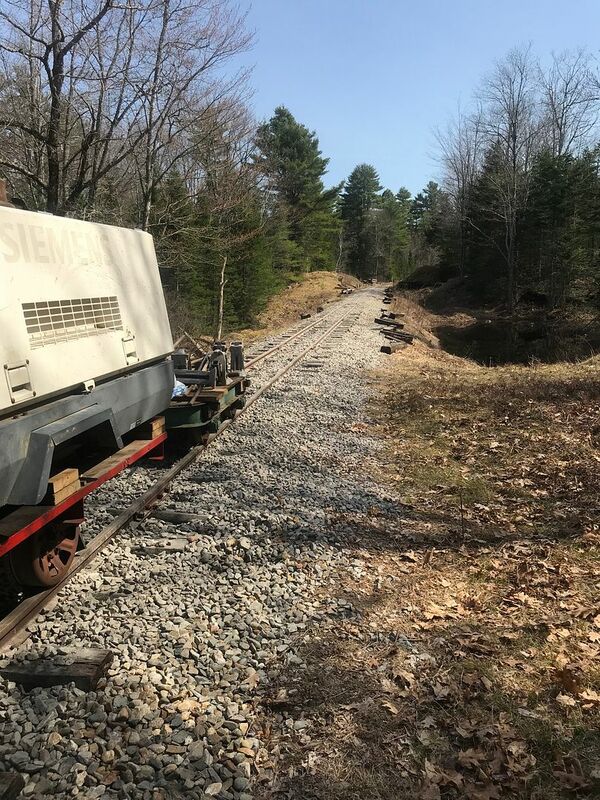 Today we finished the “Eastman Lift,” raising the remaining 180 track feet from where tamping ended just north of the old Davis rail pile, up to the high point. At its greatest the lift was about 4”. That high lift area needs dressing. 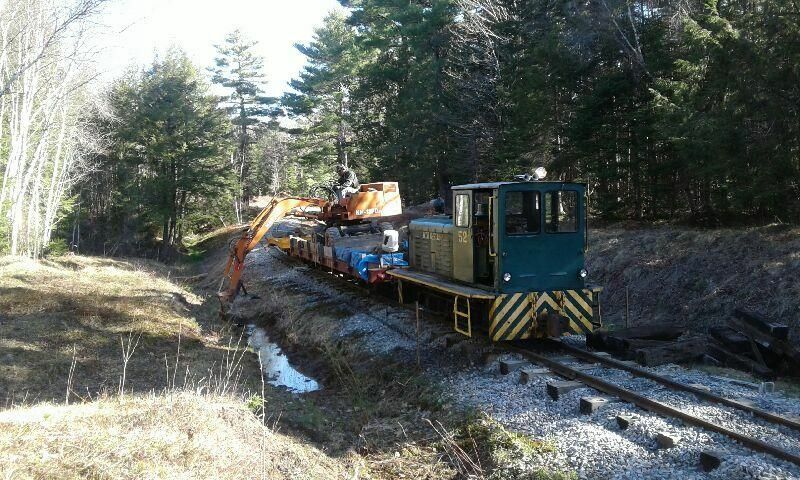 One more major lift is required on Davis grade- which involves about 200’ of track in the cut, to further ease the height difference onto the new track, and to get these older ties out of the muck. I believe this needs to wait till the week after next (see next post). The track off the north end of the new track was already similarly eased on the Sunday of work weekend. Aside from the last lift, ballast dressing is the major requirement on Davis grade now. Week of May 7-10: the bridge contractor Tim would like a 4 day work party, Monday to Thursday, in order to brace and sheathe the bridge. With sheathing, bridge assembly will be essentially complete. Tim has requested 3 crew members (one Fred) on each day. Our normal Tuesday Wednesday crew can cover those days. So- here’s a call for Monday and Thursday! Can we get commitment from two people for each of these days? 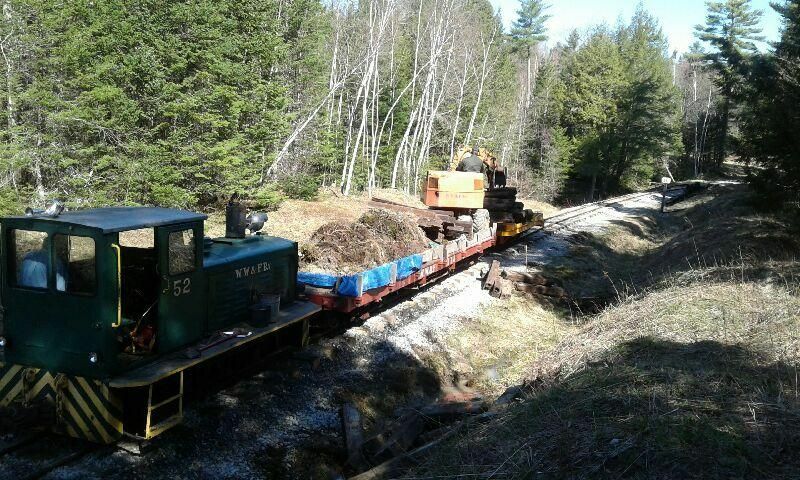 So - is the tamping now any faster with the new compressor? Beyond the fact that machines aren't mysteriously dying anymore. The compressor and pony motor are working great. Jay's amenities are pleasant (though I opted out of using the canopy today). Beyond that we've nothing nice to say about Big Joe right now. 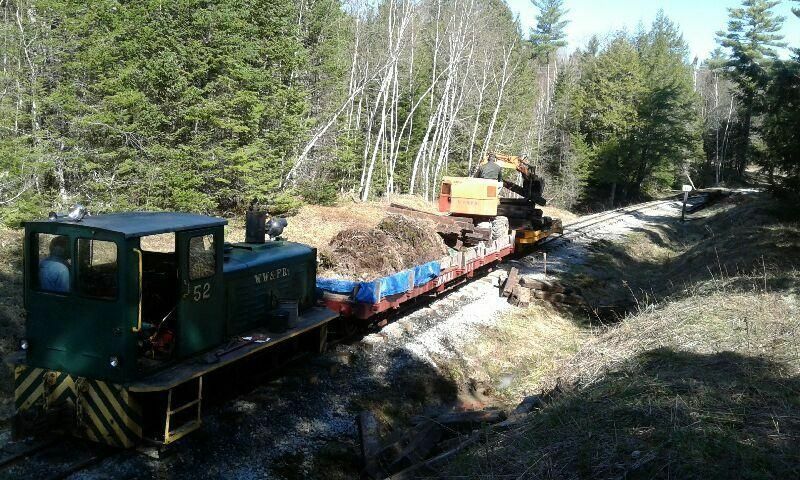 It's heading in the shop to have its tamping and drive mechanisms overhauled. Failed squeeze function, hose and gasket leaks everywhere, and a variable gauge drive axle due to a missing pin on the re-gauging sleeve. Right now the new compressor can hold the working pressure at 80 psi; that should be 100 or a little better. The pressure measurement is a good way to judge the amount of leaks. That plus noticing all the leaks. Yes and no. The work Jay did installing installing the replacement compressor and a new engine for the hydraulics was fabulous -- no issues at all there. Air pressure was considerably higher than in the past, even with two compressors running. I will say when the Big Joe is propelling itself, the new hydraulics engine sounds like a go-cart. During the weekend we did have a few of issues at the front -- a broken hose, easily fixed by Jason, a broken weld to one of the top holders for a tamper, which required a trip back to Sheepscot where Jay had to grind the metal and then weld, and on Sunday, an issue with one of the pistons which perform the pinching action on the tampers. Jason was out with us on Sunday and noted the issues with the front end. He has plans to rebuild it. Oops -- I see Jason's answer sneaked in ahead of mine! Track crew tomorrow coordinated by Dad, aka Mike, to pick up ties along Davis Grade. I will be there for a little while, time depending work. 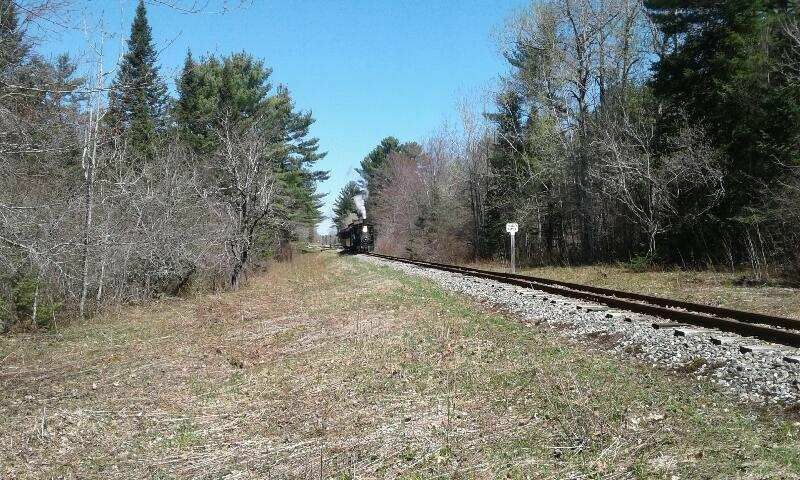 If I can be there for most of the day I hope to finish walking the line after the work train gets back. Tonight I will begin prepairing the work list of light tasks that a small 1-2 person track crew can accomplish. 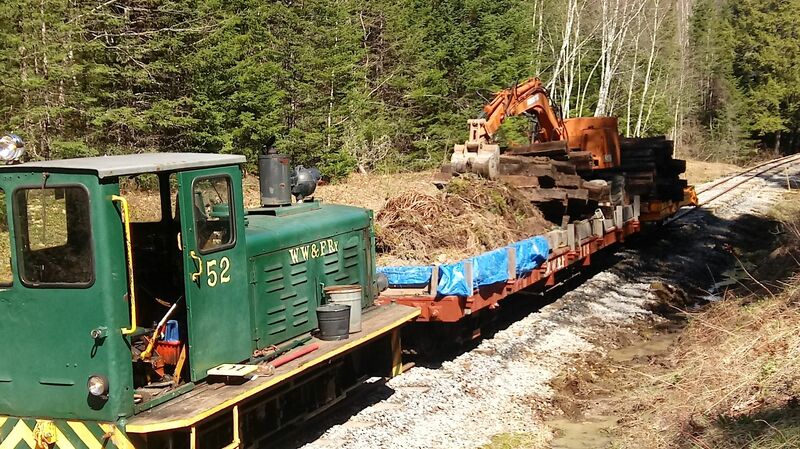 * Trackside cleanup: Mike and Joe went out with the Kubota and a flatcar to last weekend's worksite and returned with a large load of (mostly rotten) old ties and some mud from ditching. * Machine/wood shop: Alan and Harold worked valiantly to move the Cincinnati out of the shop. It was occupying track when I left. * Percival House: Zack and Sonja worked on completing the decking of the upstairs deck and decking the stairs down to where they stop (which isn't yet the ground). Meanwhile Fred's been busy tearing out the old ramp/deck on the east side of the house (it will ultimately be replaced with a new deck and a set of stairs). 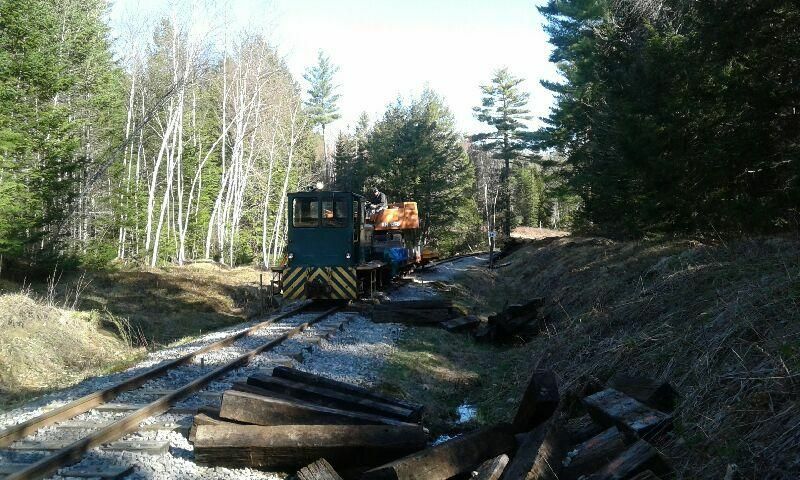 * Caboose 320: Marcel has started the process to rehabilitate the cupola, by removing windows and disengaging the cupola from the car body. * Annual Meeting: no surprises, those up for re-election got re-elected.